I’ve been meaning to finish my posts about The Bermuda Triangle Challenge, which I ran back in January, for a while now. 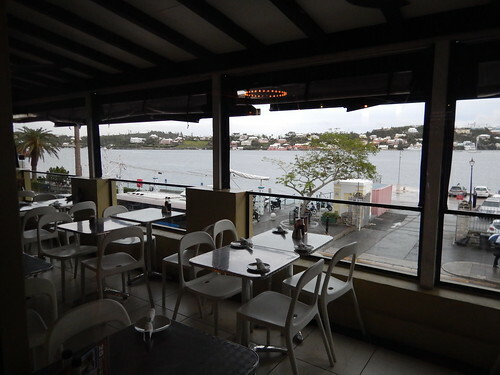 If you missed part 1 about our arrival and first impressions of Bermuda you can read it here. 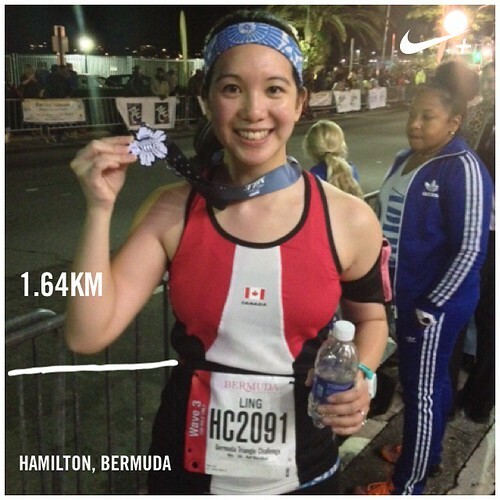 As I mentioned in part 1, it was our first full day in Bermuda and after a quick rest, I got dressed for my first race of the Bermuda Triangle Challenge, which was also my first race in 2015. Since it was an “international one mile race” I decided to wear a Canada running tank. 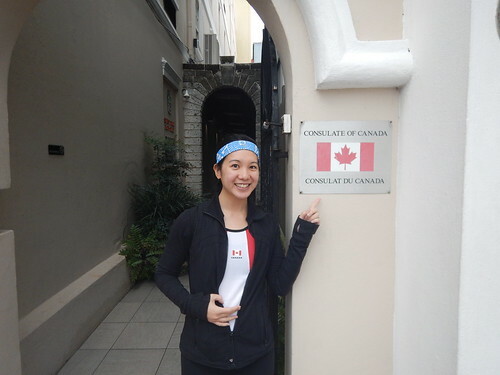 When we got to Hamilton we walked by the Consulate of Canada and I couldn’t resist taking this picture. Somebody else walking by said hi to us because he was also Canadian. We headed down to the lobby where there was shuttle service to the expo and race start. I had sprung for the shuttle bus tickets because Dan and I are now at the point where we will pay extra if it means it’s easier to get to and from the race start. I vaguely remember reading on the website that the shuttle tickets were one-way, but before we left the woman co-ordinating the shuttles told us where and when the buses would pick us up. I was excited because it meant it was a return ticket. 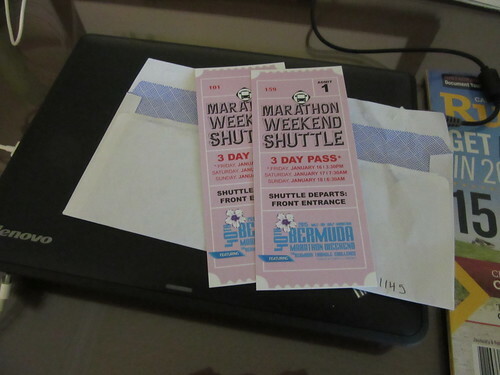 The controversial shuttle tickets. More on that later. 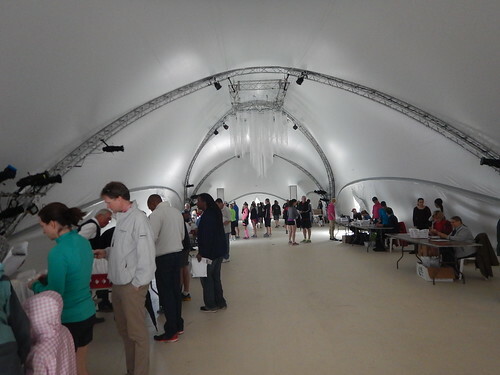 We arrived at the expo, which was very small but well organized. 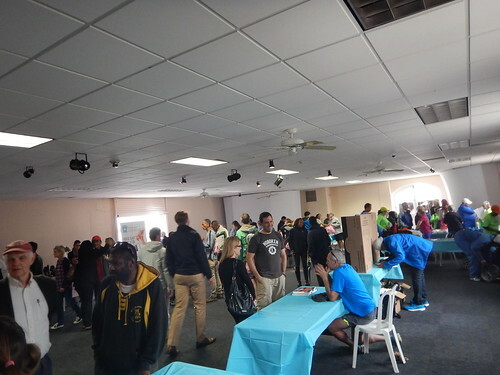 There was one main room where you picked up your race kit and then a room with some merchandise for sale. There weren’t many exhibitors but it was what I was expecting. I heard some women talk about how they’d forgotten a few things at home (running hats etc.) and were shocked to discover they couldn’t replace them at the expo. We saw Bart Yasso (Runner’s World’s chief running officer) at a table signing books and chatting with people. He runs the Bermuda Race Weekend every year. He was busy talking to a couple and we didn’t want to interrupt or hover awkwardly so I snuck a picture of him instead. Maybe next time we’ll get to chat with him. Race kit pick up. It was small but very well organized. The expo. You can see Bart Yasso in the bottom right corner. Race kit pick up was a smooth and easy process. I got a drawstring bag, my four shirts and my race bib (you wear the same race bib for all three races for the challenge). There was also a small table with official race shirts so I bought a pink one as a souvenir. My race kit. 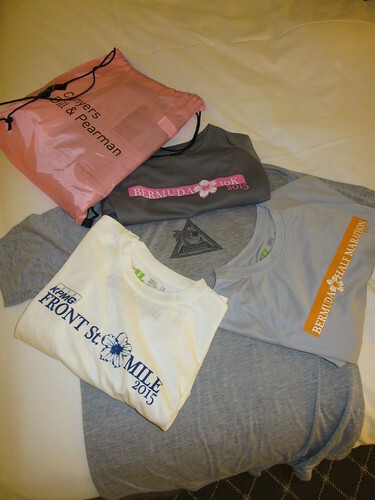 I received a technical shirt for each race and a cotton challenge t-shirt. After race kit pick up we had several hours to kill and decided to wander around and explore. One of the advantages of staying in Fairmont’s other location is that we could have just gone back to our hotel room since it was around the corner. We wandered up and down the streets for a while and then went to The Pickled Onion for an early dinner. 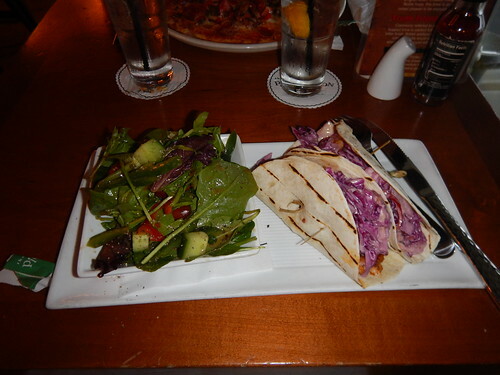 We got our order in just before the kitchen closed and I ordered Bermuda rock fish tacos and a salad. My blackened rock fish tacos. They had Bermuda Rockfish, diced red onions, fresh tomato, cheddar cheese and chipotle slaw. It was delicious. I didn’t intend on eating too much since I had to run but it was so good that I ate it all. My stomach felt heavy and I knew that I would regret it (but honestly I’d probably do it again if given the chance). The Pickled Onion overlooks Front Street and the waitress told us that the tables on the patio are booked months in advance so that people can spectate. The patio at the Pickled Onion. Later that night it was packed! It’s booked months in advance because it has a great view of the race. 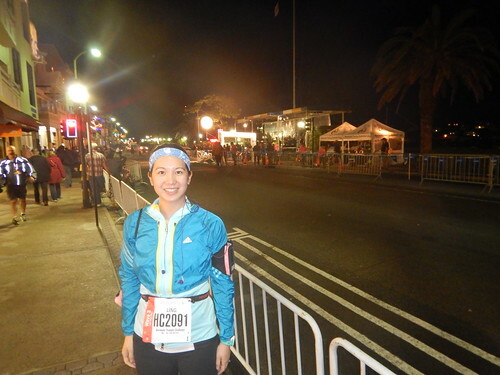 After dinner I put on my race bib and headed to the start line. We watched people warm up and I worried that it might rain. It was windy and chilly so I had my coat on. I thought about racing in it and then decided to do a quick warm up run. I ran down to the famous birdcage on Front Street and then back to Dan. I knew after my warm up that I couldn’t keep the jacket on. We saw the fast Canadians and they asked if I was hot in my jacket. They ended up leaving their arm warmers with Dan since there wasn’t anywhere to check bags or leave personal items and Dan is pretty easy to find in a crowd. Me before the race. I ditched the jacket after warming up. The corrals were split up by last name so I was somewhere in the middle. 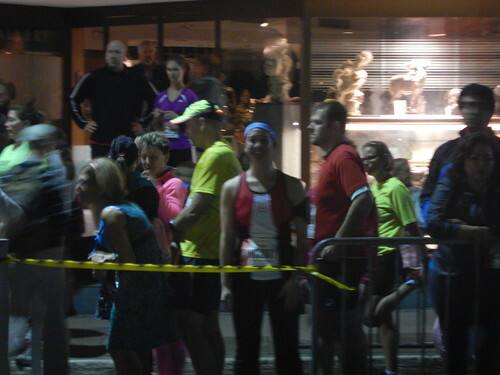 We were split into corrals since the street isn’t that wide so it helps give you space to run with less crowding. I really appreciated that. 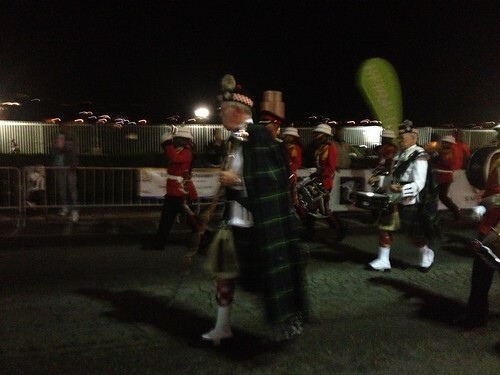 To start the race they also had a marching band! One of my blurry pictures of the marching band. The waves were four minutes apart. As I mentioned earlier, there wasn’t any bag check so I was happy that Dan was spectating so I could leave my bag with him. I saw lots of runners carrying their bags as they raced and I know that would have annoyed me. The announcer even commented that one runner looked like she was holding her bag and running like she stole it, which made her laugh as she ran by. 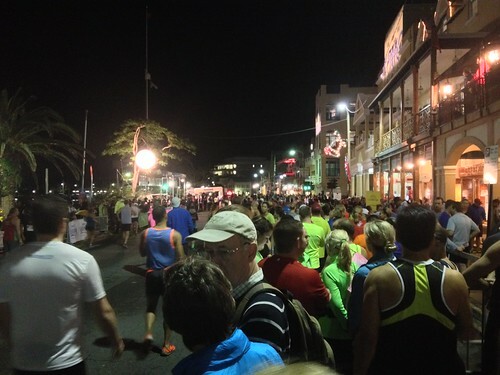 Part of what makes the one mile race special is that it’s only open to people who qualify to run it or to participants of the Bermuda Triangle Challenge. After our part of the race was done they had races for kids from primary and high school race by grade/age. This was exciting because there were many families gathered around us cheering for their kids. The kids were also amazing. After that they had the elites. 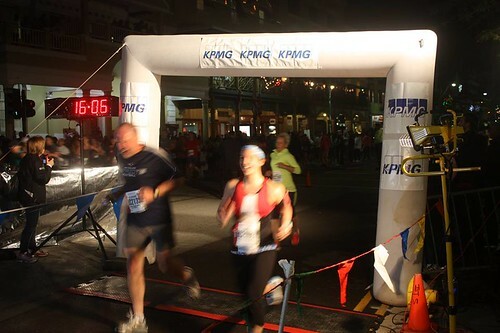 No matter who ran, there was a great crowd of spectators with incredible energy and it really was a special event. The view from my corral. Just before I set off a few drops of rain hit us but after about 30 seconds it stopped. When my wave started I took off and ran too fast. I was so excited and having never run a one mile race before didn’t really know how to pace myself. I passed a lot of people who I know are much faster than me and who paced themselves properly (they later passed me on the back half of the race). After the first kilometre I knew I was in trouble and slowed down a little. It was a tough final 600 metres for me but I somehow managed to hang on. At the end I ran side by side with another runner who high fived me after we finished. It was great! 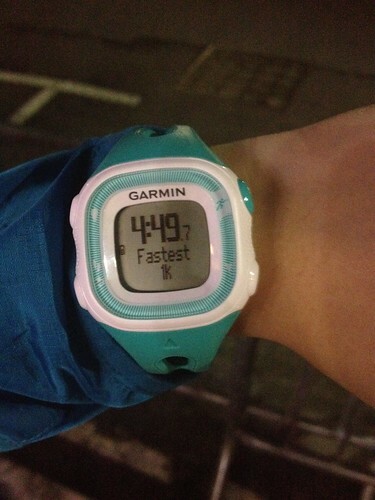 My Garmin told me that I had just run my fastest kilometre and my fastest mile ever! I was pleased. I finished my mile in 7:59.6. I was excited to just squeak in under 8 minutes. When I first started running, my goal was always to be able to run a 10 minute mile, so it’s nice to see how far I’ve come. After we crossed the finish line we high fived each other. 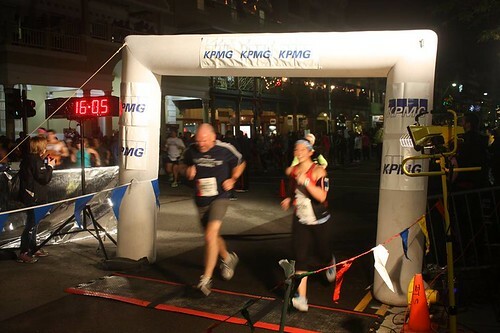 Bermuda Timing took pictures at the finish lines of all of the races and made them available on their Facebook page. Photo courtesy of Bermuda Timing. The finishing kick. Photo courtesy of Bermuda Timing. I did it! With my first medal of the weekend (and the year). I also ran my fastest kilometre ever during the race. No wonder I was winded after the first kilometre. After I was done racing we watched the kids’ races. They were really fast! We didn’t want to miss our shuttle bus back to the hotel so we didn’t watch the elites. When we got to the bus pick up point we had to wait around for a bit. It was getting cold and I was thankful that I had my jacket. Some people were in shorts and looked really cold. Finally, we boarded the bus, but before we left, the bus driver announced that our shuttle tickets were only good for one way and that we would all have to pay to go back! There was outcry on the bus (many runners hadn’t brought cash with them and nobody knew that the tickets were only one way). There was basically a mutiny on the bus and the driver tried to reason with us that the shuttle was cheaper and more convenient than public transit. People pointed out that public transit cost less than our shuttle tickets and that it was actually pretty convenient. I kept my mouth shut about what I thought I had seen on the website. I wasn’t about to side with the bus driver and I had also been confused by the woman co-ordinating the shuttles at the hotel. We pointed out that the woman at the hotel told us where and when the bus would be picking us up and never mentioned that we would have to pay. After several minutes the driver agreed that that was unfair and agreed to drive us back. We all ended up tipping the driver for being reasonable (though he really didn’t have a choice but again, it wasn’t his fault). This was certainly an interesting way to end the night!